I stepped out on the deck just before seven this morning. A breeze wind out of the west made it a bit chilly. When I looked toward the barn it looked smokey. All of a sudden a sneeze came on and had I done this at Wal-Mart, I would have heard a voice over the intercom, "Cleanup on aisle two." I realized that it was not smoke I saw, but pine pollen. It was so thick I could have planted turnips on the bannisters. Later when we walked, I saw something blooming down in the woods. I trekked down there to get a better look. 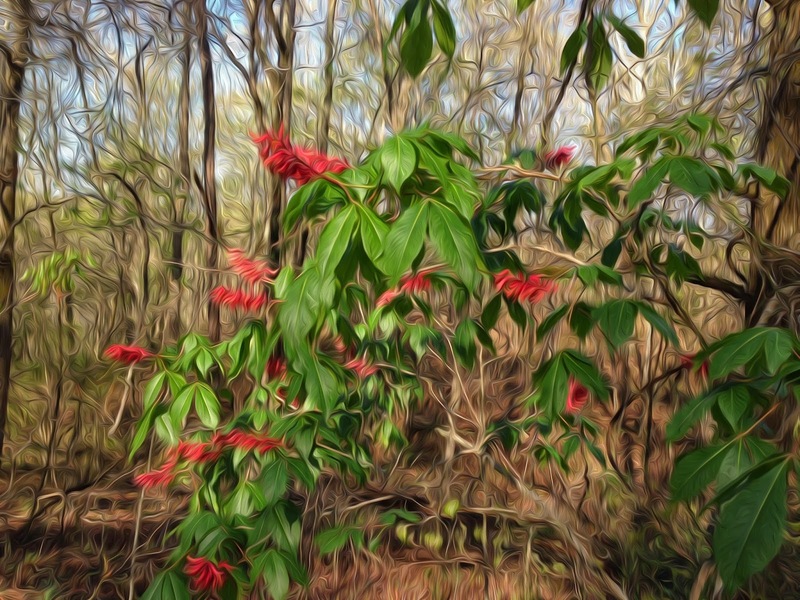 It was a buckeye bush. When the buckeyes come out on these bushes they look like small pears and the seeds inside are hard a stones. When I was a kid, we used to use the buckeye seeds as redneck ammo. We'd cut limbs off an ironwood tree, sharpen the ends, stick on buckeye seeds and fling them. Those seeds left the limber limbs so fast that you could hear them buzz. I've flung them out of sight. I can also tell you that when one hit you, they sting like crazy. Once when I got caught in a crossfire, I got clipped by a buckeye seed traveling at warp speed. I had a bruise on my side for a week. It's a miracle that one of us didn't lose an eye playing with those things. I reckon the Good Lord was watching out for his idiot children. I chuckled all through this post.... well, not at the pollen stuff because that is just not funny. Ugghh. Allergies. Rick: Love your blog, and I thank Robin for the intro. I am your newest follower. I never heard of them before, but I love your story about them...I can almost see a group of young boys living out their imaginary battle and enjoying a spring day! Come on, Rick--didn't your mother know anyone who got an eye put out by buckeye seeds? I've never heard of buckeye seeds but I bet they did hurt. We had a crabapple tree in the front yard and those became our ammo. They left some really good bruises! (smile) I like the 'Clean up on aisle 2 " line. sneaky funny. Good old buckeyes! They seem to grow every in the midwest and south. Many good hits with those, well, I got hit by them. I never knew what the tree looked like in spring. I've never seen one in bloom, quite pretty! The bloom is beautiful. Could never imagine that seeds would hurt. We used good old fashioned slingshots and whatever we could find to sling--the yellow and green candies we didn't eat (never wasted the good ones), small rocks, and popped corn. Luckily, no one got a rock or hard candy in the eyes, but I do recall Mom confiscating our weapons before too much damage could be done.